At the core of our equipment is a highly ruggedised laser diffraction instrument. The principle of operation is widely understood, and will only be discussed briefly here. 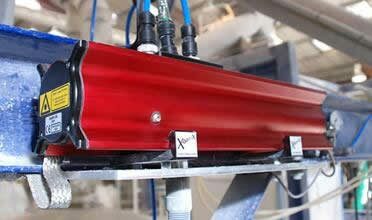 Laser diffraction instrumentation has been in existence since the late 1970s and the technique is well understood and widely used. The technology relies on the interaction of particles with light, and the principle is as shown in the following diagram. 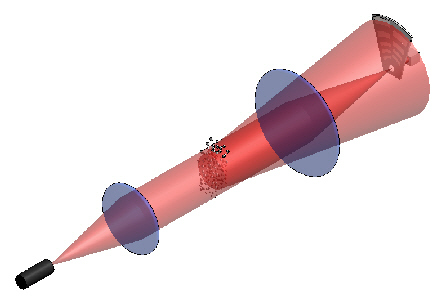 Angular scattering of light from particles is inversely proportional to their size, and the above diagram shows a mechanism for collecting this light in an experimental form. This principle is used in various adaptations by several companies who sell the products for use mainly in the laboratory for research and quality control purposes. How did we get from the schematic above to the most stable, ruggedised particle sizer for in-process measurement? The theory of laser diffraction has not changed since the early 70's, when the technique was first developed, so the schematic of what is inside our system looks very much as it did back then, and is shown here. However technology has moved on considerably in the last 30+ years, and we use high stability lasers, the best optics, and the highest spec custom designed detectors found in any in-process sizer today, and put it all inside a high quality precision optical bench. This simple step alone gave us stability not possible with any other system. Add to that carefully designed kinematic optical mounts, the latest electronics and an IP65 rated enclosure, and other patented technology, and you have the XO range of sizers. Serviceability built in. A laser change in all competitive systems can take 1 day. In our system, the same function can be completed in 10 minutes. In fact the modular construction means that all service operations can be performed in similar timescales, thus minimising downtime. Localised display. 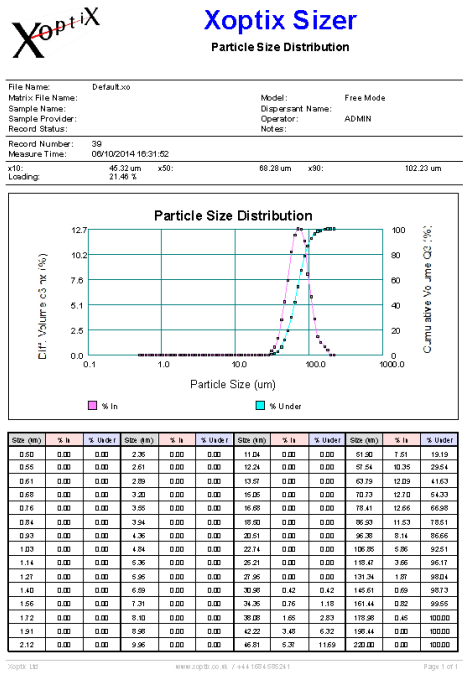 Whilst detailed particle size information is available from the computer (up to 2km distance from the sizing unit) local information of customer specified size parameters is available as standard. System built inside an optical bench giving the best possible stability. Full data analysis/presentation software suite. 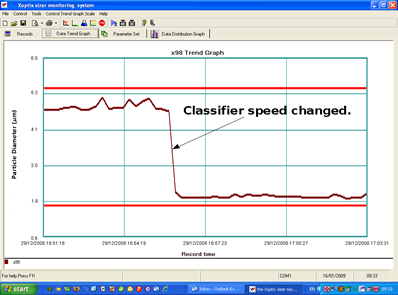 Data can also be exported to the customers requirement to any PLC or process computer.